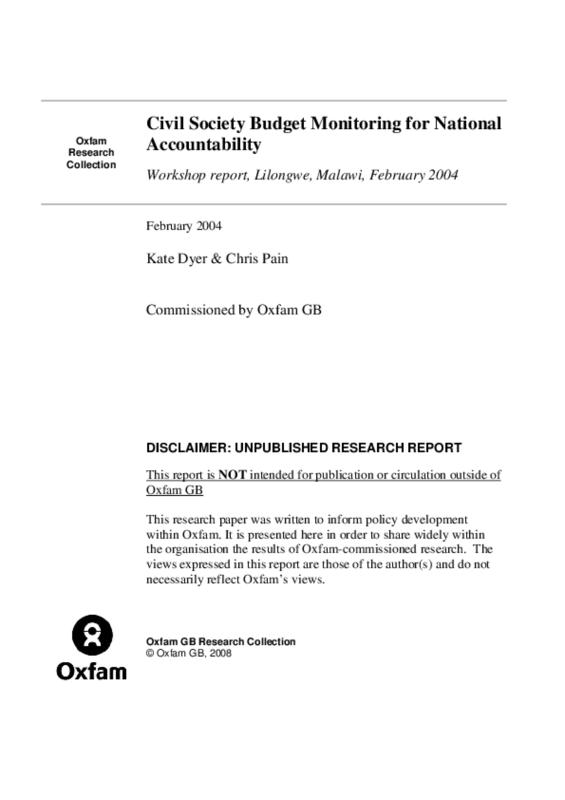 This report documents discussions and activities at the Civil Society Budget Monitoring for National Accountability workshop held in Lilongwe, Malawi,17th to 19th February 2004. The fourfold objectives of the workshop were: To bring together individuals and representatives of organisations involved in budget monitoring, or the development of monitoring processes and tools, with a view to developing a supportive community of practice of those organisations/ individuals; Locate budget tracking exercises within the broader budget cycle and budget work ingeneral; Analyse work done to date, through the development of a case studies, assessingtheir impact and the nature of the tools and methods that were used; Identify best practices in terms of budget tracking work, including ensuring its gender sensitivity, and linkages into lobbying and advocacy activities. This report will be especially helpful for OGB staff planning to undertake their own Budget Monitoring project.